Mn May 2nd 2018 Cambridge Analytica announced it was filling for insolvency in the UK and bankruptcy in the US. the siege of media coverage has driven away virtually all of the Company’s customers and suppliers. As a result, it has been determined that it is no longer viable to continue operating the business, which left Cambridge Analytica with no realistic alternative to placing the Company into administration. Voter files from the RNC. Polling using continuous large-scale research surveys in each battleground state (a combination of face-to-face, phone and online). The campaign: data that the campaign itself collected on donors, event attendees, volunteers, store purchases. Early and absentee voting returns released by each state. Consumer data available from commercial brokers. Data brokers are firms specialized in selling data of individuals to third-parties. And when compared to data owned by data brokers, the data collected by Cambridge Analytica doesn’t represent much. Consider Acxiom for instance (see the image below). 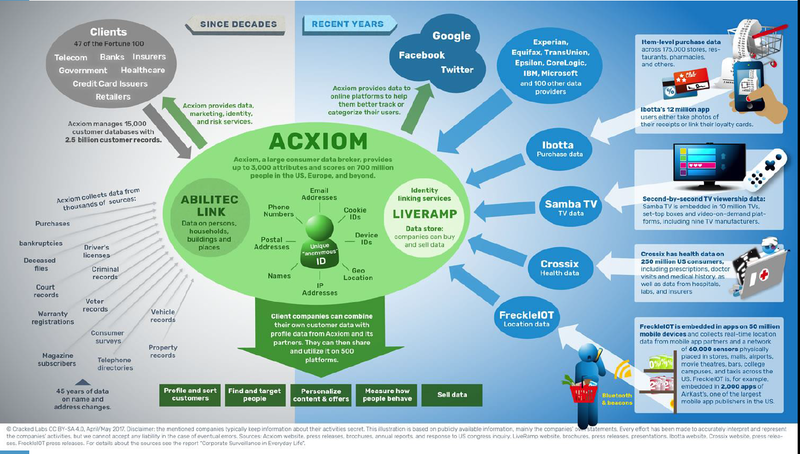 Acxiom has been collecting personal data since decades: subscriptions, criminal files, bankruptcies, vehicle records, … and has added more recently new data sources from smart TV, purchase data from thousands of stores, localization data collected through beacons throughout the US, health records, … And the best is yet to come. This massive data collection process regards 700m people across the world. While using data from Facebook to profile voters and study elections dynamics may look like something unethical (what have pollers done in the last 30 years? Wasn’t it the same?) the intrusive data collection practices are in my opinion something of a very different magnitude. Everyone focuses on the data usage practices, but much less ethical and questionable are data collection practices. Most citizens aren’t aware that their -sometimes very intimate- data is being collected, assembled, reconciled to profile them. I’ve heard a lot about how to control the firms using the data, much less about to control and regulate the data collection. Obviously the upcoming GDPR will improve the situation ; but it’s limited to Europe and there are still some big flaws (for example the principle of consent : one a subject has accepted the data treatment, whether he/she understands it or not, everything is permitted). Today’s blog post is once again an opportunity for me to call for a “data education plan“, a program that would aim at educating citizens about what data is, what it is used for and teach them how to protect themselves against unwanted data practices. This education plan must start with the younger generation and be leveraged through public service media to raise the awareness of as many citizens as possible.